Many health issues affect women more or more severely than men — breast cancer, death from heart attacks and osteoarthritis to name a few. Similarly, among women, there are conditions and illnesses that plague women of color more regularly and harshly. These include diabetes, infertility and sickle cell disease. While many factors influence this disparity, the most prominent and concerning are the lack of access to and understanding of health care resources. Because they’re less likely to have health insurance, people of color have fewer care options. We spoke to experts to get to the root causes of this systemic problem and what we can do to help fix it. Even when they can get treatment, people of color often face doctor prejudice. According to physician Dr. Nesochi Okeke-Igbokwe, negative bias directly affects care quality. She points to growing evidence that some providers believe Black people have higher pain thresholds and therefore don’t offer sufficient treatment. “Some physicians don’t even realize that they may even harbor certain biases or stereotypes about their patients of color,” she tells SheKnows. Bias doesn’t lie with physicians alone — it also comes from the health care system itself. Oftentimes, certain health services just aren’t made available to minorities. Dr. Jessica Shepherd, a gynecologist and advocate for addressing the disparity in health care, said this directly impacts treatment of fibroids, which up to 80 percent of Black women are likely to experience. To eliminate complications from fibroids, these women are often told to get hysterectomies — a procedure to remove the uterus. However, several less-invasive surgical options are available, such as laparoscopic or hysteroscopic myomectomies, endometrial or radiofrequency ablation and uterine artery embolization. “Insurance companies will approve [minimally invasive surgeries] in certain cities and states and not others — and a lot are cities and states that have a high number of African-American women,” Shepherd tells SheKnows. This is especially true in Southern states, where the proportion of fibroids and hysterectomies are higher. As a result, these other options aren’t even on the table for many patients, and they can’t ask for care that they don’t know exists. This lack of information is most glaringly found among women of color who need mental health care. Dr. Dion Metzger, a psychiatrist, tells SheKnows that this phenomenon is twofold. First, communities of color have minimal, if any, access to mental health resources. And second, they see little merit to seeking professional help. When facing hard times, people of color are more likely to turn to their communities and their faith than go see a doctor. 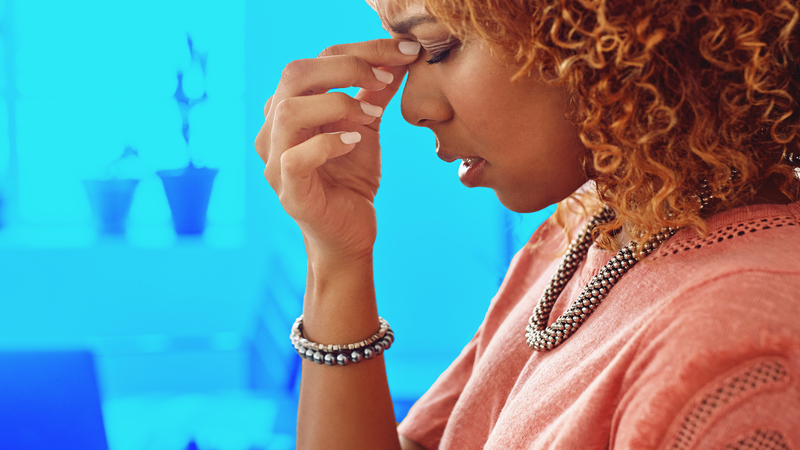 Many women of color aren’t even aware that what they’re facing is treatable. Instead, they perceive their struggles as a sign of weakness. Metzger ascribes this to the fact that women are “often the foundation of the family.” They spend so much time taking care of others that they have little energy left to devote to their own health. As part of her strategy, Metzger also modifies the language she uses. “Saying ‘depression’ scares people off,” she explains. Instead, she focuses on the concept of burnout, which shares many of the same symptoms: hopelessness, change in appetite or sleep patterns and major disruptions in significant areas of life, such as work or relationships. When laid out in this manner, patients often realize they should’ve come to get help a lot sooner. In fact, waiting too long to see a doctor seems to be another major component impacting the health of women of color. This may be an extension of the desire to seem strong that Metzger notes with her patients or simply a side effect of limited resources. Regardless, it’s putting women at risk. Health care disparity is a serious issue women of color face. In dealing with bias, inaccessibility and misinformation, they must be empowered to proactively improve their overall well-being. They need to get educated about their options and find reliable health care providers they trust. Only then can women — or anyone in need of serious care — get the treatment they need when they need it.